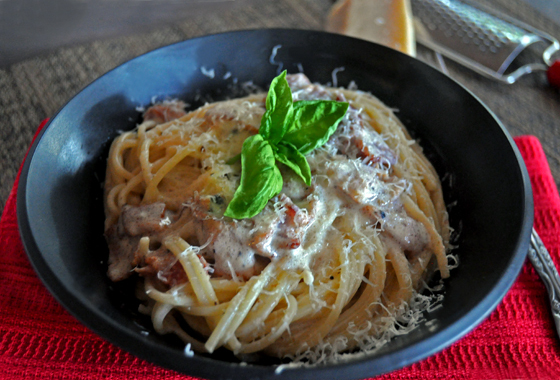 Here is one of my favorite pastas and also one of the quickest ones you can make. From start to finish it's about ten minutes, it is simple and really delicious. I started making these back home as a quick meal when I was probably around 13, and we've all been making it ever sense. The key to it is lots of black pepper. If you don't like lots of pepper, it's still yummy enough with just a pinch or two, but to me it doesn't have that awesome flavor and kick that I like without it. Anyway, it has like five ingredients and it's done in five minutes. This one is a no brainer for me. If you want to get really fancy with it you could try adding some sauteed mushrooms or onions with it, it would make it even heartier, but I like it's simplicity like this. Bring salted water to a boil and cook your pasta al dente, according to the package. While the pasta is cooking, start frying the bacon on the pan where you will toss the pasta in. Once it is nice and cooked, not quite crispy, pour half and half over it and then after a minute add the sour cream and parmigiano reggiano. Season with sale and pepper, I put at least a tablespoon of freshly ground black pepper or even more. I really put a lot, please season it according to your taste, though. Cook for a few more minutes and then add about a 1/4 cup of nice and starchy spaghetti water to the sauce. 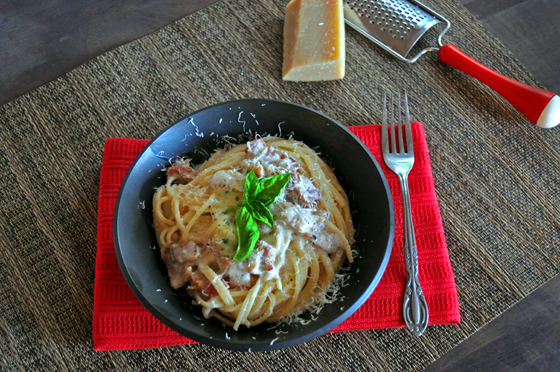 Strain your spaghetti and toss in the sauce, garnish with some more freshly grated parmigiano reggiano.